In 2002, he wrote “The Play o the Wather” (click for script), a translation/adaptation of John Heywood’s 16th Century comedy, reworked and rewritten in Scots. 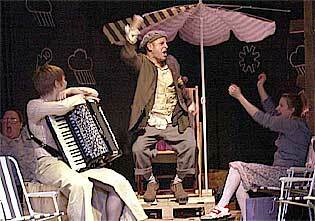 This work had its first outing at the Edinburgh Festival Fringe in 2002, where it was hailed by the critics as…. Eddie Stiven began writing for the Stage with the much admired, and frequently revived, “Tamlane”, first performed by the newly formed Theatre Alba in the early Eighties. “Glamourie is the old Scots word to describe enchantment. A magical spell is cast in the open air by a burning fire under the trees with a big moon hanging in the sky, by this superlative translation of the Ballad ‘Tamlane’ into drama. Misty figures move mysteriously along the dusky horizon and in an effortless mell of music, movement and sturdy articulate Scots, the tale of Tamlane’s thraldom ‘Tae the Queen of Elfinland’ unfolds. Tamlane was revived later that year in Edinburgh’s Traverse Theatre. Tamlane at the Old Traverse in the West Bow. Line drawing by Ricky Demarco. The Brunton Theatre in Musselburgh staged it again in 1987. “The Illuminati” was a commission for Highland Youth Theatre in 1984, on which Stiven was also a tutor/director, had a highly successful tour through the Highlands over that summer. The play tells of the conversion of a pagan society to Christianity, and draws particularly on the mission of St Columba in the 6th Century. In 1986, Stiven was commissioned by Perth Repertory Company to write a Theatre in Education piece for a tour of Perthshire Schools. This was an adaptation, in comic/pantomime style of Sir Walter Scott’s “The Fair Maid of Perth.” The tour was highly successful and enthusiastically received by a large audience of young people. In 1988, Stiven returned to the theme of Celtic Legends set in a historical context with “The Cauldron”, a quest tale set in 6th Century Scotland. It was produced by the Brunton Theatre in Musselburgh. The success of The Cauldron at the Brunton, and its subsequent tour by Theatre Alba, led to a Scottish Arts Council commission for another play the following year. This was “Under the Passing Stars”, an adaptation of the old Celtic tale of “Daerdre of the Sorrows”. In 1998, Stiven was given a major commission by Scottish Youth Theatre to adapt the whole of the Celtic epic cycle, “An Tain Bo Cuailnge” (the Cattle Raid of Cooley) also known as “The Ulster Cycle”. This is the story that tells of the great conflict between Connaught and Ulster that arose over Queen Maeve’s coveting of the great brown bull known as “Donn Cuailnge”, and Ulster’s heroic defence by the great boy hero, Cuchulainn. It was produced as a pan-Highland project in five one-act plays, and finally as one five-act play at Eden Court Theatre in June 1998 under the title, “The Bull Raiders”. It was highly ambitious in its scope with a running time of over three hours, utilising a cast of ninety-three young actors and musicians. The setting is post-modern, with the traditional tales re-set into a futuristic world recovering from a nuclear holocaust.